Poker comes in quite a few variations, and when a flop is involved, there’s no arguing that the undisputed king is Texas Hold’em. However, that doesn’t mean that there aren’t other poker variations that closely follow in the footsteps of Texas Hold’em. One poker variation that continues to enjoy an increase in popularity is the game of Omaha. The game of Omaha has many sides to it and can be enjoyed in several different ways. There is no exact origin for the game of Omaha, but it’s believed that the game was introduced to Bill Boyd in 1983 by Robert ‘Chip Burner’ Turner. Bill Boyd used to operate the card room in the Golden Nugget Casino situated in Las Vegas, and the game was initially offered under the ‘Nugget Hold’em’ name. The name was later changed to Omaha, as we know it today, but unfortunately, there’s no evidence as to when or how it changed either. Most land-based casinos offer all variations of Omaha nowadays, including low stakes and high stakes cash tables. You’ll also find all Omaha variations online, so there’s plenty of Omaha available for everyone. If you would like to know how Omaha is played and how the rules work, look no further. We compiled the perfect guide explaining the rules of the game and included a couple of frequently asked questions to ensure you get a good grasp on the game before heading out to play against other players. 1. How popular is the game of Omaha? 2. Are there Omaha tournaments online? 3. What are the stake levels in Omaha? 4. Can you claim bonuses as an Omaha player? 5. Can I play Omaha for free? We are going to start with the rules for Omaha High, normally just known as Omaha. In Omaha, players can only play it as a high hand game, much like Texas Hold’em. Alternatively, players can play it as a split-pot game by using the Omaha Hi-Lo variation. With Omaha, players will notice that the game functions in much the same way as Texas Hold’em along with a handful of differences and characteristics. 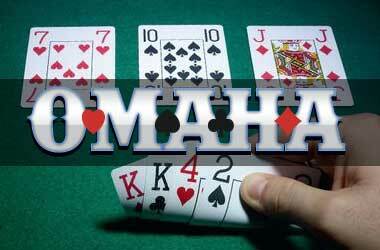 Although we are unaware of the origin, there’s no doubt that Omaha derived from Texas Hold’em. The hand rankings are identical to poker variations featuring high hand only poker. Players in Omaha are dealt four cards face down. So, for those who have been playing Texas Hold’em, this is the first huge difference you’ll come across in Omaha. Players will also quickly notice that more suited connectors and pairs will be dealt more frequently with four cards instead of two cards. However, its best that you don’t get too connected with your initial four cards as the rules for Omaha are going to limit you to only use two of them. You will not only be limited to using two, but you are also going to have to use two. In addition, the two card you need to use could also change as the hand unfolds from street to street. Before the deal, the game will follow the same Texas Hold’em format. There will be a rotation dealer button along with a forced small blind and big blind with the action continuing to the left. It’s worth mentioning that players might take more time to decide on their next action while holding four cards. Once the preflop betting has commenced, the flop will be dealt by the dealer. As previously mentioned, although you were dealt four cards, you will only be able to use two. Not only can you use two cards, you MUST use two cards. Once the flop has been dealt, players will have their first chance to look at their hands and see what hand ranking they might have. The player to the left of the dealer button will go first and continue in a clockwise rotation. Players that are still in the hand after the flop will have a vast variety of possibilities in front of them. Draws in Omaha Poker are huge. While players could use two of their cards on the flop, giving them a two pair, they might also have a flush or straight that requires the use of one or two other cards, greatly depending on what they have in their hand. Once the betting round has completed, the hand will continue. Once the turn card has been dealt, the action will continue with the first player to the left of the dealer button. With the turn, a player’s hand value can greatly change to feature a stronger hand, but keep in mind that this will also be true for your opponent’s hand. The likelihood of a player using one, or possibly two cards, in their hand, is quite high, and with one more card to be drawn, it might change again. The river card is the final drawn card, and the action will continue in the same style to the left of the dealer button. After the river card, a player’s hand will be finalised. A player can only use two of their hole cards to combine with the community cards to form the best possible hand. In Omaha, there is no playing the board. For instance, if there’s a diamond flush on the board in Texas Hold’em, and a player’s hole cards are spades, a player can simply play the board thanks to the flush. However, in Omaha, if there is a diamond flush on the board and a player’s hole cards do not contain any diamonds, they won’t be able to play the board to have a flush. A player MUST use two hole cards to give them the best possible hand along with only three cards from the board. In addition, if the board is K-K-K-K-8, none of the player’s will have four of a kind kings because they MUST use two hole cards from their hand. Jumping straight into Omaha poker online can be very tempting as the game provides a great deal of fun. However, before you make such a drastic move, especially if it’s your first time playing the game, first browse through the FAQ section below to getting a better understanding. Although Omaha is not as widespread as Texas Hold’em, it’s quickly expanding across land-based casinos as well as in the online gaming industry. The game is growing in popularity so fast that most poker sites have a dedicated tab for Omaha cash tables nowadays. The World Series of Poker event featured an Omaha tournament along with a buy-in of $1,500. More than 1,000 players entered, pushing the prize pool over $1,37 million. Yes. While most of the weekend guaranteed tournaments are normally reversed for Texas Hold’em, players can still look forward to a decent number of tournaments featuring the game of Omaha. Most of the popular poker sites offer Sit n Go Omaha tournaments as well. So, instead of operating on a set schedule, a Sit n Go tournament will start when the table is filled up. As there aren’t many players who fuel big guaranteed Omaha tournaments, the Omaha Sit n Go community is always a lot stronger, so there’s always an Omaha Sit n Go tournament running. Online Omaha players love to play for big money, so most online poker sites usually offer poker rooms with high stakes to accommodate these types of players. However, if you are new to Omaha and don’t wish to spend a fortune, you will also find a range of low stake cash tables at larger poker rooms. Regardless of your bankroll size, there will always be multiple stakes to choose from. Just be sure to compare all poker sites that offer Omaha and check which stake levels suit you best. Definitely. Online poker bonuses also apply to Omaha, just like Texas Hold’em. Those playing Omaha can also benefit from the huge deposit bonuses. Players will be pleased to know that the deposit bonuses offered by poker sites are available on all poker variations, not just Texas Hold’em. Most poker sites will only be concerned with the amount of rake you accumulate and the amount of tournament you enter, and don’t care what poker variation you play. Yes, you can. All poker sites will have a dedicated section where you can play with fun money. However, it’s good to first check that they do indeed offer a fun money section before you register with them. Playing Omaha for fun is a great way to test your skills, see how each round unfolds, and how the betting works. Playing with four cards instead of two cards per hand will be quite a different experience. In addition, you won’t have to spend your hard-earned cash to learn the game of Omaha, and once you get the hang of it, you can venture onto low stakes cash tables to see how you do. Our Poker Predictions For 2019, Will Any Come True? Copyright &COPY; 2014 - 2019 Top 10 Poker Websites. All rights reserved.